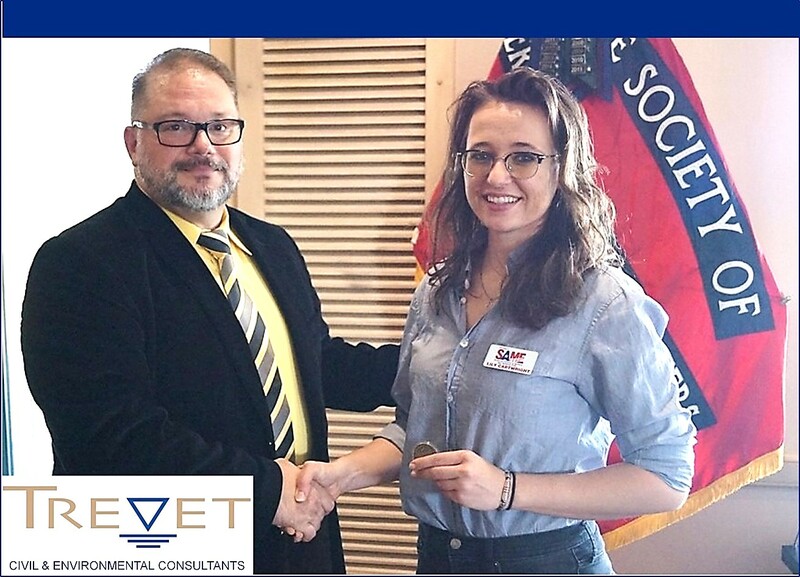 Lily Cartwright Receives Society of American Military Engineers Recognition for Outstanding Service as a Young Member | Trevet, Inc.
San Antonio, Texas (April 5, 2019) — Society of American Military Enginee rs (SAME) San Antonio Post President Scott Mikos presented Trevet Staff Environmental Engineer Lily Cartwright with the SAME Coin for her outstanding service to the Post as a young member during the Post’s March 2019 meeting. A long-time volunteer to the San Antonio Post, she stepped in as Assistant Secretary in 2018, and helps with the University of Texas San Antonio Student Chapter and the Austin Field Chapter. Trevet joins the SAME in congratulating Lily on this significant accomplishment in supporting the organization and its volunteer and fundraising efforts.